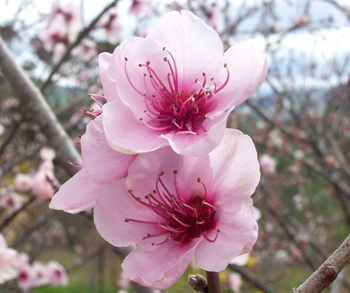 The peach tree is a well-known fruit tree; the tree may grow as high as 20 to 25 feet, but orchard trees are usually kept shorter. The leaves are thin, serrate, and oblong-elliptic to lanceolate. The flowers are a delicate pink. The tree flowers in spring and harvest of fruits is in the autumn. 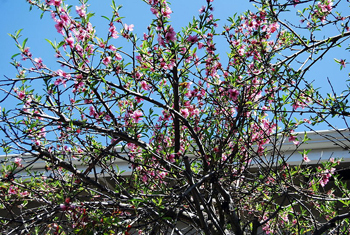 Another variety: Wild peach (P. andersoni), called Tsanavi by the Paiutes, who make tea from the branches for colds. Widely cultivated in temperate and warm regions all over the world. 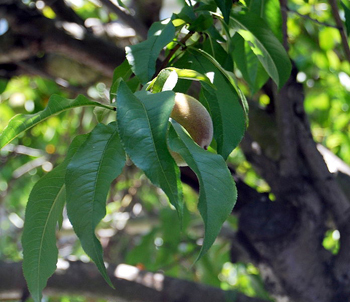 In the United States, California is the predominant peach-producing state. The peach is indigenous to China. Culpeper, and also the Herbalist Almanac, state that if the kernels of peaches are bruised and boiled in vinegar until they are thick, then applied to the head, it make the hair grow again in bald places, or where the hair is too thin. The peach is indigenous to China. The wood is used in fortune telling; the flowers are supposed to have some supernatural power in driving away the demon of ill health; the leaves are regarded as a parasiticide. Slips of peach wood were used as charms against evil spirits. The slips were worn on the person, attached to the door of the house, or set out in the rooms of the house. Peach leaves stimulates the flow of urine, they are mildly sedative, and helpful for various nervous conditions. They can be used for chronic bronchitis and chest congestion. The leaves help to relieve vomiting and morning sickness, but their dosage must be regulated to avoid excessive laxative action. Powdered dried leaves have sometimes been used to help heal sores, ulcers and wounds. Infusion: steep 1 level tsp. leaves in 1 cup boiling water. Take 2 to 3 cups in the course of a day, as needed, with the first cup before breakfast. Tincture: for nausea, take 2 to 15 drops in water, 30 minutes before meals or as needed.